Eye tracking provides a clear and accurate picture of where a person’s visual attention is focused. This information can be used to demonstrate the cognitive processes attached to particular tasks, and assess the level of understanding displayed by students during the learning process. The skillset of an experienced medical practitioner takes years to develop and is the result of time and practice. Many techniques are attached to cognitive processes which are subconscious and instinctive, making them hard to explain. Eye tracking provides a method to not only identify these behaviors, but record and observe them, giving students access to this valuable knowledge. 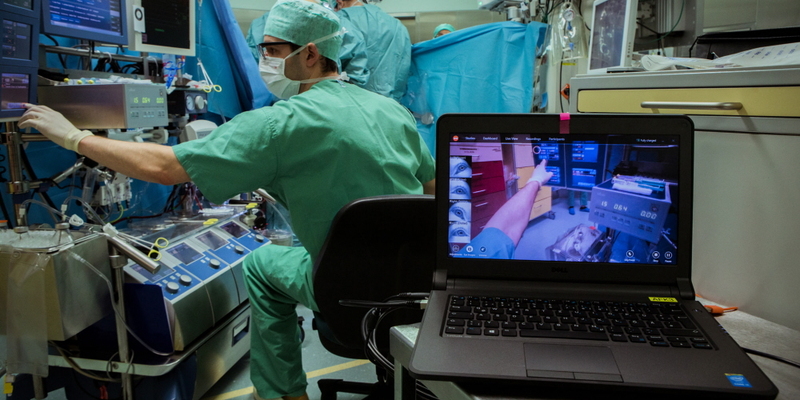 "This is the first time we can actually get data on visual human information collection…and we can use this data to optimize training procedures, we can also optimize operative procedures." The German Heart Center in Berlin has used eye tracking to examine the cognitive processes of perfusionists, to see how they respond to different stimuli and complications during a procedure, and how they distribute their attention across relevant areas of interest. This knowledge has been used to better articulate the process of operating the heart-lung machine and monitoring the patient's vital signs. Eye tracking has also been used to assess whether students display the correct attention patterns during simulated surgeries, and to make comparative evaluations of stress levels and behavioral patterns during real and simulated procedures. Eye tracking has been used in a wide range of published research examining medical procedures. If you’re interested in learning more our Zotero Library has a range of resources. Some notable pieces of work include this article examining the gaze patterns of urologists when conducting simulated procedures with varying degrees of difficulty and this piece, which looked at the cognitive load of surgeons performing classical and laparo-endoscopic single-site surgeries. For eye tracking research within the medical field, we offer the Pro Glasses 2 wearable eye tracker. Lightweight and unobtrusive, it provides immediate insight into an individual’s visual behavior. For clinical applications, we offer the Medical edition of Pro Glasses 2, which has medical grade certification within the EU.